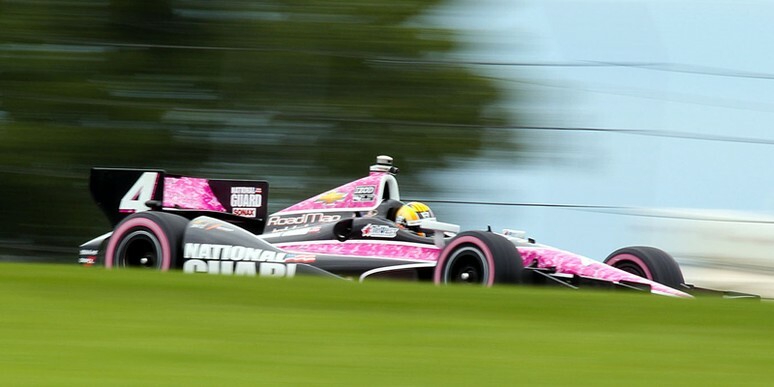 LEXINGTON, Ohio - (August 4, 2013) – National Guard Panther Racing driver Oriol Servia finished in the 14th position Sunday in the Honda Indy 200 at the Mid-Ohio Sports Car Course in his “Pink Camo” No. 4 National Guard Chevrolet. Servia’s day was eventful; the Spaniard had a monster first lap, nearly crashed during a tank-slapper in Turn Nine, but recovered nicely with the help of the National Guard crew. The race was Servia’s third start in the National Guard car after previously driving for the team at Texas and Iowa Speedway. Servia started in the 17th position but passed three cars on the first lap alone to quickly climb the grid to 14th position. The Spaniard continued to be aggressive during his first stint, but got loose in Turn Nine and had to pull off a dramatic save to keep the No. 4 car on the track. Servia lost four positions as a result, but with the help of the National Guard pit crew, was able to methodically pick up those positions throughout the duration of race. The team made three flawless pit stops during the race to help its driver through the field and Servia was able to pass EJ Viso, Graham Rahal and James Davidson on-track to make up many of the positions he’d lost previously. As he took the white flag in 15th position, he was able to pass Luca Filippi exiting the Keyhole (Turn 3), to secure his final finishing position of 14th. Charlie Kimball captured his first career victory in dominant fashion, and was joined on the podium by Simon Pagenaud (2nd) and teammate Dario Franchitti (3rd). Panther has not announced its driver for the next IndyCar Series event at Sonoma Raceway, but it’s likely Ryan Briscoe will return to the No. 4 car if cleared from the broken wrist he suffered in Toronto. If he competes in that event, it will be his last start for the team in 2013 as he has conflicts with his ALMS commitments for the final three races of the IndyCar Series season. The IndyCar Series will have two weekends off before traveling to Sonoma, California for the GoPro Indy Grand Prix of Sonoma, which will be broadcast live on NBC Sports Network on August 25th at 4:00 pm (ET), with additional coverage provided by the IMS Radio Network, XM/Sirius Channel 211. Practice, qualifying and race coverage is also available on the IndyCar Mobile app from Verizon.